Quiche. 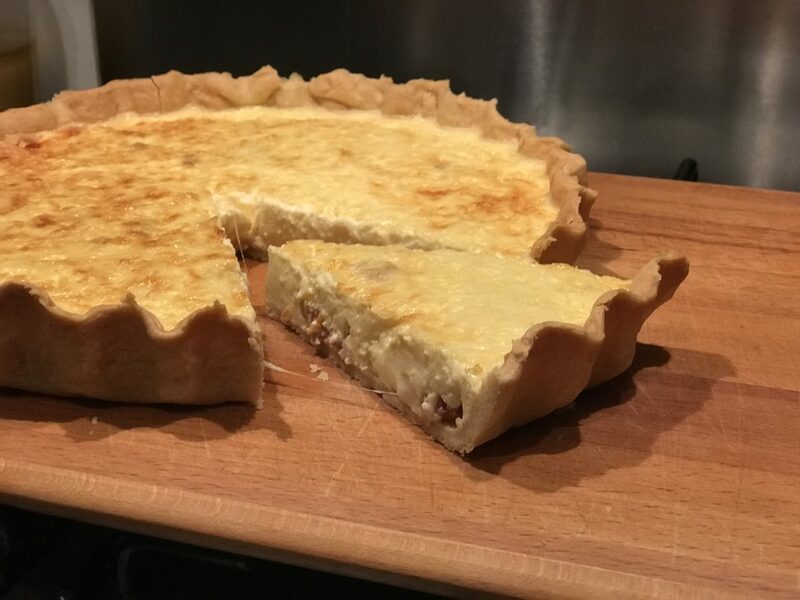 It may seem an outdated dish, and Quiche Lorraine is the most out dated of them all. 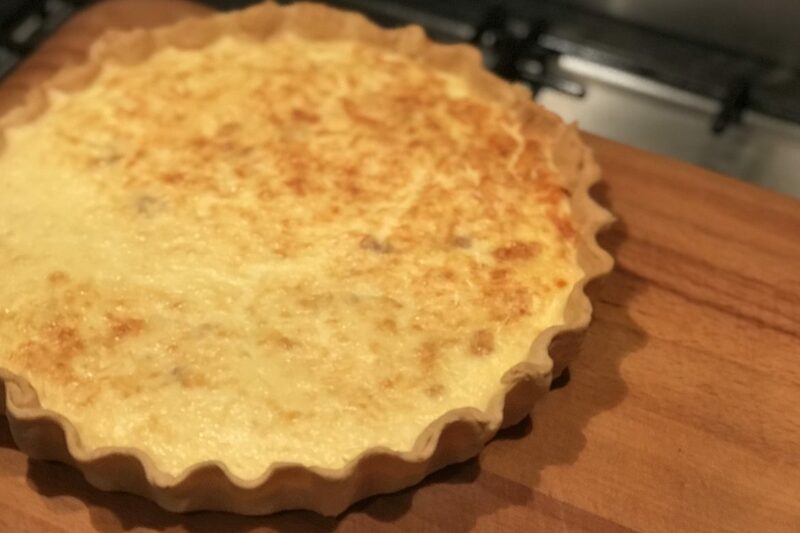 But it’s not, it’s a classic and for good reason, cheese, egg, lardons, and cream in a pastry case. What’s not to Love? It’s superb both hot and cold as a light meals with a side salad and this version is infinity better than anything you can buy pre-made in the shops and is incredibly simple to make. Quiche really is simple to make even if it has a reputation of being otherwise. Heat the oven to 200C/ fan 180C. Lightly butter a 24cm x 2.5cm fluted tart/flan/quiche tin with a removable bottom. Roll out your pastry to a 3mm thickness and then line the tin with it. Be sure to push the pastry into the fluted side. Lay a sheet of foil or baking parchment on the pastry and fill it with baking peas or dried beans/dry rice. Then bake in the oven for 15minutes. Remove the pastry from the oven, take out the foil and baking beans and then put the pasty back in the oven for a further 5 minutes. While the pastry is blind baking, gently fry the onion and garlic till soft, then add the lardons and fry till they are cooked but not coloured. Then put the crème fraiche in a bowl and whisky it as you slowly add the double cream. Then add the beaten eggs, a pinch of salt, pepper and nutmeg and whisky until fully combined. Once you’ve removed the pastry case from the oven and allowed it to cool for 5-10minutes, cover the base of it with the onion, garlic and lardons. Then scatter over the diced gruyere and pour over the cream and egg mixture. Scatter over the grated gruyere and place in the oven to cook at 190C/ fan 170C for 25minutes. The filling should be light and just set. Once cooked, remove from the oven and allow to cool for 5minutes before serving with a side salad. Prev postIce, Water, Neat… Who gives a dram?! Next postRevisiting GoldenEye 007 on the N64: The Greatest FPS of All Time?